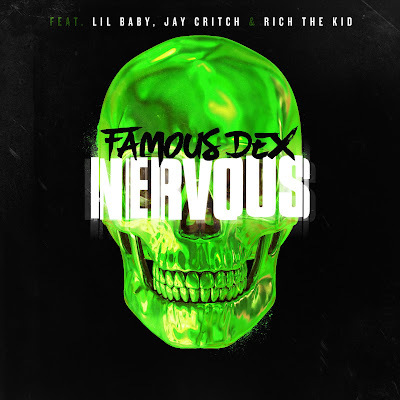 famous dex jay critch lil baby rich the kid Famous Dex, Lil Baby, Rich the Kid & Jay Critch Team Up for "Nervous"
Famous Dex, Lil Baby, Rich the Kid & Jay Critch Team Up for "Nervous"
Famous Dex kicks off the fall with his newest single, "Nervous" featuring hip-hop heavy weights, Lil Baby, Rich the Kid, and Jay Critch. The high energy record is produced by Take A Daytrip, one of the producers for Sheck Wes's viral "Mo Bamba" record. "Nervous" comes shortly after the TRL premiere of Dex's "Light" music video featuring Drax Project. Earlier this year the Chicago artist released his debut album, Dex Meets Dexter, which included the smash hit records, “Pick It Up” and “Japan,” both of records have gone platinum in the U.S. Appearances on the album include: A$AP Rocky, Wiz Khalifa, and Diplo. Take a listen to "Nervous Ft. Lil Baby, Rich the Kid & Jay Critch" below and look out for new project from Famous Dex this fall.